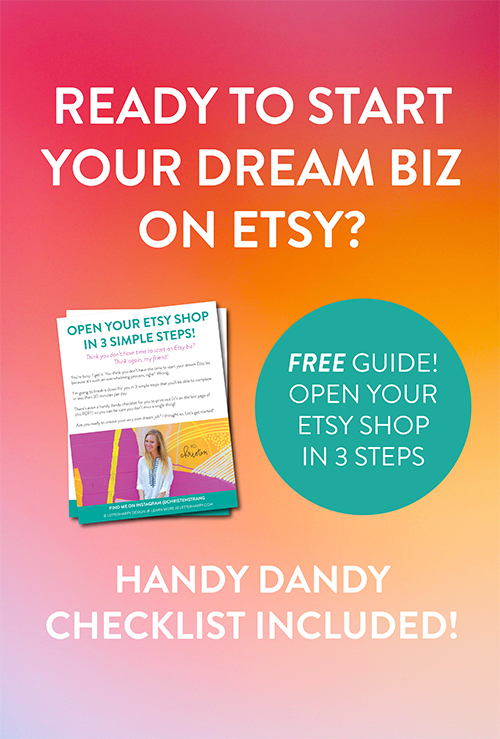 ARE YOU READY TO BECOME AN ETSY SEO SUPERSTAR? I've been working on something super fun (and FREE!) for you. Because to move forward as a super successful Etsy seller, you absolutely MUST have awesome SEO. Like, it's just non-negotiable. Mandatory. SO FREAKING IMPORTANT, I CAN'T EVEN. Etsy is built on search, so even if you have the best product in the entire universe, if you're not using the right search terms, no one will find you, which means no one will buy from you. Then you NEED to join me for this 5-day challenge because we're gonna bust through all of those (and more! ), while building you a superstar SEO formula that you can use on every listing you already have, and every listing you'll create in the future. You'll get emails in your inbox every morning with lessons and action steps, and you'll join me LIVE every evening inside my private Facebook group to recap, chat, and brainstorm. Okay, seriously.. what are you waiting for? All the juicy details are below. We're starting Monday, September 10, 2018, so get your booty inside! See you there!